Your build will be placed in Scythian Peaks as official town build. You will get a builder's credit on the build. 1 llama with chests filled with goodies + virtual llamas to an overall worth of about 5000 ll. 2nd place: 1 llama with a chest filled with goodies + virtual llamas to an overall worth of 3000 ll. 3rd place: A herd of virtual llamas to an overall worth of 1500 ll. You are allowed to work together with other players to create your build. Each player can enter only one build and there will only be one reward per entry, regardless of how many players contributed to it. Create your build on /server creative on your or your teammate's plot. The Skyblock Results are In! As we start a new skyblock season, it's time to look back and celebrate all of the awesomeness of the last one. Congratulations on your beautiful islands - over 200 were created! Many were small but beautiful. Some were incredible and huge, with our top finalist's island containing the equivalent of 105,400 blocks of cobble. In Third Place, a unique, creative, new entry with 707 levels: Seth25R! In Second Place, another closely fought new entry, super cute, with a valiant 737 levels: Mafersauros! Finally, our creative island prize* goes to Xieandra for their colourful tropical town island which perfectly fit into the season's Cities theme. Abros_vii will win a mainworld prize of 5000llamas, 2000ll going to Seth24R, Mafersauros and Xieandra. Your prizes have been paid into your accounts. Finally, honourable mentions also go to our full top 10 finalists. A Whole New World New skyblock season! The new skyblock season has arrived! We hope you have a wonderful time making your islands. We think we have increased mob spawning rates but it's a work in progress and we need your feedback. We want to balance mob spawning with the fact that some players have older computers with more lag. Please let staff know if you suddenly have issues playing. We now have a challenge currency! Every time you complete or repeat a challenge, you will be given a red sand block. The final challenge is to collect and submit all 1800 red-sand blocks..... (you have a little wiggle room, that isn't quite all the repeats). If you complete that final challenge, modreq for a special skyblock mainworld prize and 5000 llamas! If you don't care about the final challenge - use the red sand however you like. The bug where the torches don't light on arrival on the island is not fixable. To fix the torch issue, replace a torch or add a torch nearby and all the nearby torches should light. To solve the issue of villagers dying, your initial companion will not be a villager, but no fear! People who enjoy mining cobble will soon be reunited with their villager companion. A Whole New World New Survival Season! Welcome to the new survival world! This is classic vanilla survival. No special mods or changes to be aware of. Here's a few screenshots from the wonderful snowy last season. Ice town was awesome! It's that time again. Take your screenshots, wish goodbye to the challenge hall, fly around your islands one last time and get ready for new survival and skyblock seasons! This will reset one week later - again no promises on an exact day/time. Server Event The Second Mapiversary - Happy Birthday, Main Map! On this day two years ago, on March 4th of 2016, a few days after we said good bye to our original map, the current main map on the economy server opened its doors for the first time. It was an exciting new start. We all started back at zero, with Nerdtropolis, Solara, and Thistledown, waiting to be explored and populated with awesome and interesiting new builds. Since then, five more town's have been added to Nerdcrafteria's custom made beautiful landscape: Playertowns Emerald Falls, Nouveau Batiment and the recent Drakerberg, as well as two more staff administrated towns, Scythian Peaks and Viridian Isles. Everything was new and exciting and together we managed to create a beautifull new place to meet our friends and relax. To celebrate this second mapiversary staff is holding a town themed staff auction at 4pm EST today. Each of the current 8 towns will have one chest dedicated to them. The items of each chest reflect the towns style and atmosphere and will also include at least one unique, uncraftable lore item. We hope to see you around at the auction house at /warp auction later today! A gleaming city of media and games, host to magnificent apartments housing hundreds of players as they navigate their first steps in Nerdcrafteria. Marble statues and parthenons and coliseums surrounded by vineyards and an ocean ripe for trade. The largest tree in the world, with floating islands and plots nestled under dim green branches. A forest creeping with oversized inhabitants and a rich vein of emeralds beneath the jungle canopy. Dozens of variously-biomed islands, linked together by intricate bridges. Shining spires of quartz and coal, windows and walls made complex and the whole town dedicated entirely to art. Collossal geodes and crystals hidden in an ice-capped mountain, away from the modern village just outside. A newly-discovered land of moss and dragons, where spires of rock rise from the sea to support viking structures of old. We’ve built a lot over these past few years on Nerdcrafteria, and with our 2nd birthday since reset just around the corner (that’s right, we get two birthdays now) it’s time to celebrate our collective achievements. Come one, come all to the Nerdcrafteria Town Auction! Each chest is dedicated and themed on a different town, with plenty of goodies inside and as always one super-rare lore item! /warp auction will lead you to the auction house. 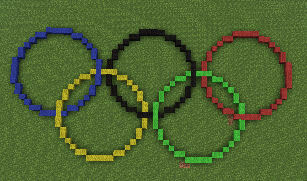 Operating in concert with the 2018 Winter Olympic and Paralympic Games in PyeongChang, South Korea, the towns of Nerdcrafteria will be hosting our own Olympic Games! Beginning with Opening Ceremonies in Nerdtropolis on February 10th, Every Saturday will feature a new town playing host to an official Olympic Games Event! Participate in fun team competitions or individual challenges! Discover the towns you know in new ways! On the Third of February, Year Two Thousand and Eighteen, the grand city of Drakerberg will open its doors to all! At 5pm EST, Drakerberg will be holding its Grand Opening Ceremony. So come and enjoy all of the sights and sounds this new town has to offer! But you’re here for PLOTS! And what a selection we have! There are 98 plots for enterprising young adventurers like yourself! We have Towns, Mountains, Ships, and even entire Sea Stacks reserved for you to build as you like! We shall start shortly following the Opening ceremony by releasing plots 1-53 on Flemmjell Island at 5pm EST! The next opening will be plots 54-60, and 90-98 held February 4th at 5pm AEDT! This one will include most of the sea stacks. And finally, the Fellsing island plots, 61-89, will be released to you, young adventurer on February 4th at 5pm CET. So join us, Young Adventurer, and discover the world that awaits you far beyond the Northern Oceans! Copyright © 1999 - 2018 Jagex Ltd. 220 Science Park, Cambridge, CB4 0WA, United Kingdom. Downtime (Resolved) No Spectre or Meltdown for us, thank you very much. see those gaps in the code fence on the right? Right...there, yes that one. There's also one on the back left. That's not good. And because it's not good our hosting provider (the company that runs the physical server) will has closed them. Starting from Jan 10th, 4am EST the forums will be offline. We don't know how work-intensive the fix is, so we also don't know for how long the forums will be offline.